Citation Information: J Clin Invest. 2012;122(2):722-732. https://doi.org/10.1172/JCI58618. 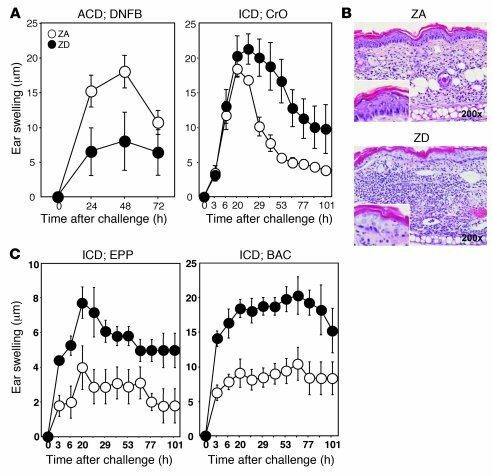 ZD mice demonstrate severe ICD with histological degeneration of keratinocytes. (A and C) ACD responses to DNFB and ICD responses to CrO, EPP, or BAC were induced in ZA (white circles) and ZD (black circles) mice, as described in Methods. Ear thickness was evaluated at the indicated time points. The data shown are (n = 5) the swelling responses (mean ± SD). (B) H&E staining of ear samples collected from ZA or ZD mice 24 hours after topical application of CrO. Original magnification: ×200; ×400 (insets). Data are representative of 3 independent experiments.